I started a second Flowers In A Row afghan. I'm halfway through and I've only been at it less than 2 weeks. 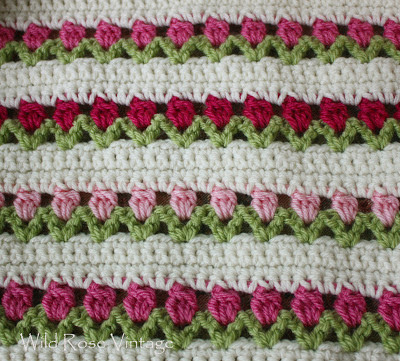 It's such a fun and easy afghan to crochet! The first one I made using lavender and yellow flowers with the same green and cream. As I was working on it I decided I'd like to make one with 3 shades of pink. Whats so fun about this pattern is it's easy, very little counting and the color variations are endless. Really cute! I love those rows of flowers! Your afghan is adorable. It really looks like little flowers. 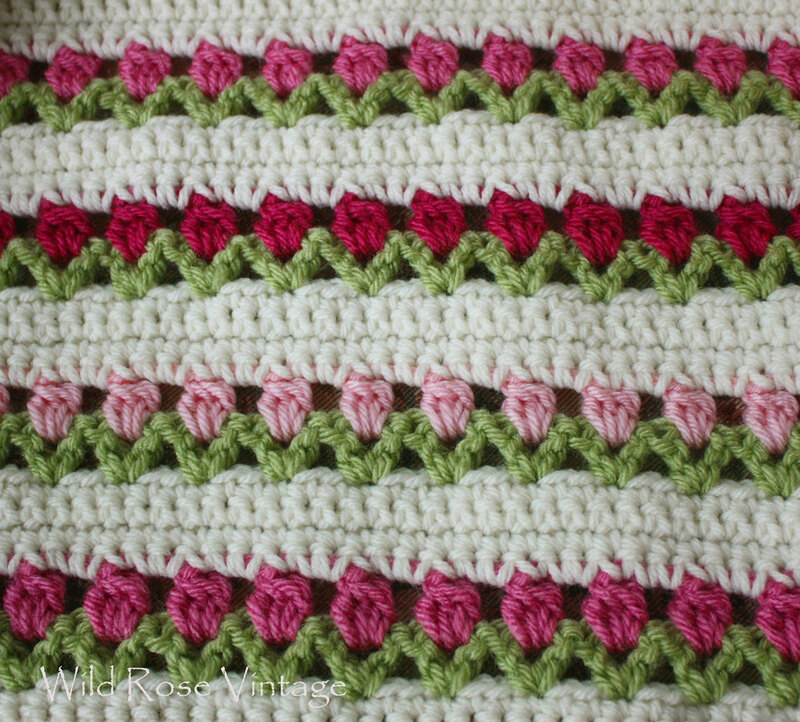 I'm pinning it to my list of things I'm going to make when I remember how to crochet! Lovely and love the colors. I made a few afghans many, many, many years ago but they were easy granny squares. I'm always in awe of you that can make such pretty things. I have seen several different afghans but not this pattern. Very pretty and you are doing a great job. It is VERY PRETTY, Faye!!! I love that you used 3 colors for the roses! It's just lovely! I have not seen that pattern, but I love it. I may have to give that one a try. I love the spring one with all my favorite colors in it! THe colors are perfect! And you do such a nice job! I really need to get back to crocheting...I stopped after learning how back when I was a teen. Thanks so much for stopping by to enter my 5th anniversary giveaway! The deadline has been extended until Friday since I was away on vacation. Love this so much I wish I remembered how to crochet! This is so pretty! Love the tiny flowers. Thank you for sharing it at to What We Accomplished Wednesdays. Have a great week! Oh my goodness! this is one of the prettiest ones ever!!! I wish I could crochet. The colors are perfect on this one! You are really good at this, Faye. I LOVE this! I, too, just finished an afghan. But this is the cutest pattern I've seen in a long time. Fun and different. I am going to download the pattern. Wowser, I love this!!! Seriously this is one of the prettiest afghans I've ever seen! What a great pattern. Thank you for joining Home Sweet Home. LOVE this Faye, especially the pinks. Taking this pattern to my next beginner crochet class because I simply must have one!! What a beautiful color combination and pattern! Thank you for sharing! Beautiful yet simple idea and love it in the pinks. Had a quick look at the pattern but what yarn is Aran? Could I make this in doubleknit in the UK? 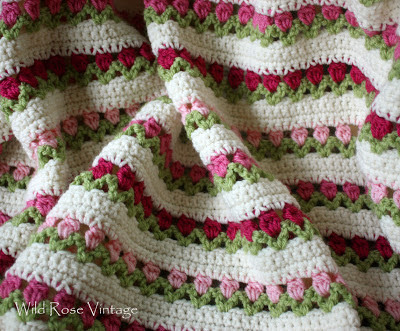 I just love this afghan! so beautiful! thank you for sharing! I shared it with my readers as well providing a link back to your blog! Muy bonito tu blog, enhorabuena! Me encanta la manta afgana de florecitas, es una preciosidad. Algun día me atreveré a hacerla. This is beautiful!! I love the different shades of pink! Thanks for sharing!